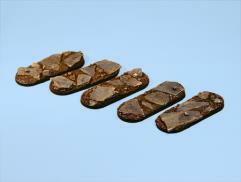 Rectangular resin bases with rounded ends, 25*50mm with straight edges. Very detailed models depicting a scenery with slates stones and sandy ground. Suits any 25 up to 32mm miniature (Mounted units, Motorbikes, crews). Sold unpainted by 5 assorted units .